Wogpoles (オタマ?, lit. 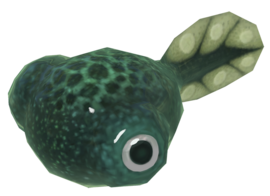 : "Tadpole"; also known as Wolpoles) are harmless enemies in the Pikmin games. They resemble tadpoles in appearance, and are in fact the larval form of the frog-like Yellow Wollywogs. In Pikmin, they only appear in the The Forest of Hope and The Distant Spring areas. They are typically a hard-to-get, low-reward enemy in that they are fast swimmers which produce only one Pikmin seed when carried to the Onion. In Pikmin 2, Wogpoles are found in the Awakening Wood (being chased by wild Blue Pikmin) and the Perplexing Pool, as well as the sublevels of certain caves where they have the treasure value of merely × 1. While being chased, Wogpoles may sometimes accidentally beach themselves, flopping about helplessly until they land safely back in the water. They may also drop from the ceiling, usually on a dry spot in an otherwise wet level. As a side note, the Wogpoles in Pikmin seem to be closer to maturation than those in Pikmin 2, as the legs near their tails are present. In Pikmin 3, they can be found in the Tropical Wilds, the Garden of Hope, and the Distant Tundra. Their skin is now a teal color instead of dark blue, and their AI has been refined to run directly away from approaching leaders instead of in random directions. "The Sheargrubs of the water swim near your Pikmin and distract the troops, but they don't cause any real harm. If you have the time, you can harvest them for minimal sprouts or Pokos. If not, ignore them." "Wogpoles are harmless aquatic creatures that retreat any time they feel threatened. If you're determined to defeat a Wogpole, it's usually best to send a squad of Blue Pikmin charging in to attack the creature. Most of the time, however, it's not worth the time it takes for your Pikmin to chase down a fleeing Wogpole." In Pikmin and Pikmin 2, although they constantly swim away from leaders, Wogpoles will occasionally stop for a few seconds when only chased by Pikmin, giving the Pikmin a chance to attack. Wogpoles themselves can't attack, but they can cause flower Pikmin to lose their petals when they shake the predators off. Since they only yield one Pikmin seed when retrieved, they're almost always more trouble than they're worth. One way to catch it mid-chase is to extend your Pikmin group into a line such that the creature swims into the line. This does not necessarily mean it will be hurt, though. If any Wogpoles are on land (such as in the Shower Room, where they drop from the ceiling), they can easily be attacked with any Pikmin, though their floundering can make the process slower. The new AI in Pikmin 3 allows the player to rather easily force the Wogpole along the pond walls until it flops onto land, allowing even non-Blue Pikmin to kill it and take it with them. If the Wogpole is not killed in time, it will eventually flop its way back into water and swim to its spawning location, regardless if it is being chased or not, making it even easier to defeat that the original Wogpole with Blue Pikmin. It might also stand still for a while, granting an opportunity for a charge. Japanese name: ダルマイモガエル?, lit. : "Daruma Potato Frog"
The name "Wogpole" is a combination of "wog", from "pollywog" (like other amphitubers), and "tadpole". This enemy, like the Wollywog and Yellow Wollywog had to be renamed to Wolpole for the European versions of New Play Control! Pikmin, New Play Control! Pikmin 2 and Pikmin 3. In Japan, its name is オタマ?, which written like that means "ball" but it's short for オタマジャクシ? which means tadpole. In its scientific name, Amphicaris frodendum, frodendum is similar to the Latin word frondeum, which means "leaf-like". This could be referring to its leaf-like tail. The internal name in Pikmin and in Pikmin 3 is the same as the Japanese name, otama, and the Pikmin 2 name is the same as the English translation, tadpole. 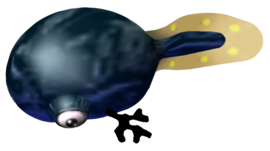 In the GameCube Interactive Multi-Game Demo Disc Version 18, this enemy's scientific name is mistakenly the same as the Water Dumple's – Ichthyosa Felinis. The Wogpole as seen in the enemy reel of Pikmin. The Wogpole was renamed to "Wolpole" in the enemy reel of the European version of New Play Control! Pikmin. Artwork of a group of Wogpoles from Pikmin 2. A Wogpole in an earlier version of Pikmin 3.